Peterbilt Factory Installs Aero Devices for P.A.M.
P.A.M. Transportation Services is beginning to take delivery of 550 new Peterbilt Motors Co. trucks that the manufacturer will factory install with FlowBelow Tractor AeroKits, the aftermarket supplier announced. The kits, which are designed to improve the vehicle’s overall fuel efficiency, feature wheel covers and a pair of tandem fairings that work together to reduce turbulence and drag around the exposed rear wheels of the tractor, FlowBelow said. 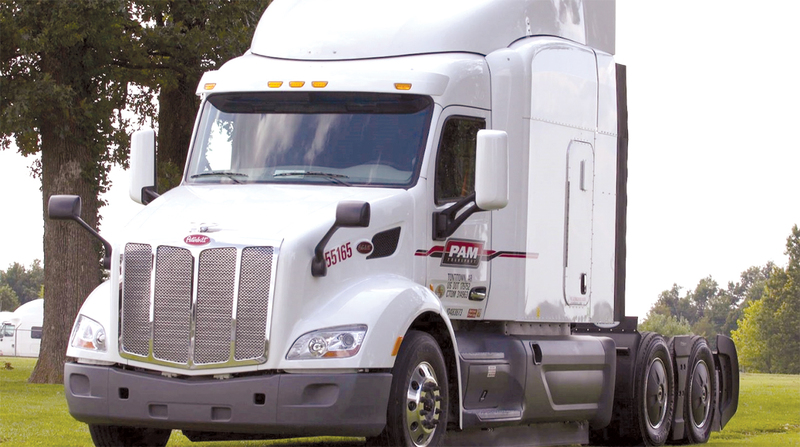 Before moving foward with factory-installation of the equipment on the Peterbilt Model 579 trucks, P.A.M. said it participated in a series of tests with Peterbilt and FlowBelow to verify the performance of the equipment. In the initial round of testing, five trucks were evaluated. This was followed by a series of tests on 200 trucks: 100 with FlowBelow equipment installed and another 100 without. After nearly a year of testing, the trucks with the aero kits showed a 2.2% average fuel savings compared with those without the equipment. “For any fuel-saving technology that we consider, we first look to see what the OEMs are doing,” Paul Pettit, P.A.M. Transport’s vice president of maintenance, said in a statement. “A demo truck that we received with the FlowBelow system performed extremely well and piqued our interest. We then tested five FlowBelow units as an initial pilot.” That test, he said, was followed by the 200-truck study. The Technology & Maintenance Council of American Trucking Associations has studied truck aerodynamics extensively. While not commenting specifically on FlowBelow’s product, TMC said wheel covers can improve a truck’s fuel efficiency by 0.5% to 2% depending on how they are installed and maintained. “We believe that our pursuit of fuel efficiency is a necessity and that reducing costs is always a priority,” P.A.M. CEO Dan Cushman said. The fleet already uses auxiliary power units, fuel tank fairings, low-rolling-resistance tires, trailer side skirts and automatic tire pressure systems. The cost to have AeroKits installed at the factory was not disclosed. However, an aftermarket version of the equipment is available for about $1,800, and FlowBelow said the return on investment in fuel savings would take 12 to 18 months. “Doing something about that airflow and controlling it around the wheels has a profound impact on the aerodynamics and then the fuel efficiency of the truck,” FlowBelow President Josh Butler said in an interview with Transport Topics. “The tandem axle fairing and wheel cover options provided by FlowBelow and factory-installed by Peterbilt furthers exemplifies our commitment to providing Peterbilt customers with options that push the boundaries of efficiency,” said Wesley Slavin, Peterbilt Motors Co. on-highway marketing manager. P.A.M. Transportation Services ranks No. 71 on the Transport Topics Top 100 list of the largest for-hire carriers in North America.